KRAMER produced the GORKY PARK in 1989. 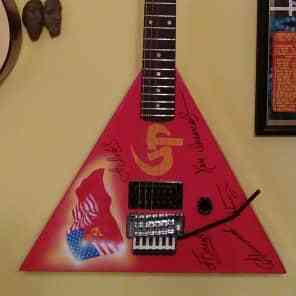 It was shaped like a Russian Balalaika. This was the period just before the fall of the Berlin wall and the Soviet Union and this was the signature model of Alexey Belov (of the Russian glam metal band Gorky Park) - but Alexey's instruments were custom made for him whereas the production model of the Kramer Gorky Park was made in Korea. It had USA and Russian flag graphics on the body as well as an orange "GP". Take the KRAMER GORKY PARK price survey.